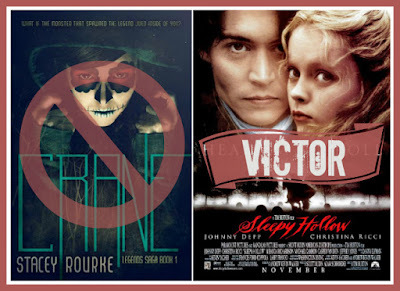 This week I'm featuring two very different retellings of The Legend of Sleepy Hollow - Crane by Stacey Rourke and Tim Burton's Sleepy Hollow. I've had my eye on Crane ever since I saw that AMAZING cover! I couldn't really figure out what the super weird, painted face had to do with the Headless Horseman, but I knew it was probably good. I'm a sucker for a good retelling and this one was truly unique! Right off the bat it's obvious that this is not a normal retelling of the classic myth. 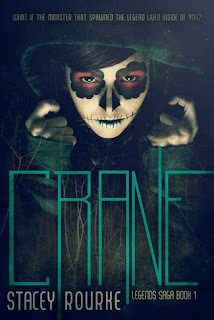 This is primarily the story of Ireland Crane, a distant relative of Ichabod himself. She's had a rough breakup and moves to Sleepy Hollow to make a new start for herself as a guidance counselor at the local school, but nothing goes quite as she planned. I really liked Ireland's attitude immediately. She has kind of a "meh" attitude that I can really identify with. Like, "well, this happened and I can't do anything about that so I'll just crack a sarcastic joke and move on." She's a strong character who rolls with the punches and doesn't take crap from anyone. Ireland's love interest, Noah, was not really in the book enough for me to make a real judgement call on him, but I like what I've seen so far. He seems to be very caring and accepting and I can't find much fault with what I know about him at this point. I really hope he'll be a little more fleshed out in future books! The characters in the flashbacks were also really great! Because they had almost half the book to themselves, I felt like I really got to know them. I didn't care very much for Katrina, but I think that had a lot to do with the time period, to be honest. I loved Ichabod! He was not what we've been led to believe Ichabod Crane is and I really enjoyed his no-nonsense approach. Rip Van Winkle was an interesting addition who I also greatly enjoyed! He was hilarious at places, but still a serious, main player in the story. I do wish there had been more of the book devoted to Ichabod's story though! The world building was good too, but I wish I had felt a little more dread when the town was being established. It felt a little off somehow, but I never got the feeling of gloom and total creepiness I would expect from Sleepy Hollow. I can't say too much about the story without spoiling it, but suffice it to say I definitely enjoyed this unique take on a retelling! Nothing was quite as it seemed and there was plenty of mystery in this story that's already so well known to keep it fresh and interesting! I'm definitely planning to read book two and find out what happens next in the saga! Washington Irving's tale of Ichabod Crane and the Headless Horseman gets a few new twists in a screen adaptation directed by Tim Burton. In this version, Ichabod (Johnny Depp) is a New York City detective whose unorthodox techniques and penchant for gadgets make him unpopular with is colleagues. He is sent to the remote town of Sleepy Hollow to investigate a series of bizarre murders, in which a number of people have been found dead in the woods, with their heads cut off. Local legend has it that a Hessian ghost rides through the woods on horseback, lopping off the heads of the unsuspecting and unbelieving. Ichabod refuses to believe in this legend, convinced that there must be a logical explanation for the murders. 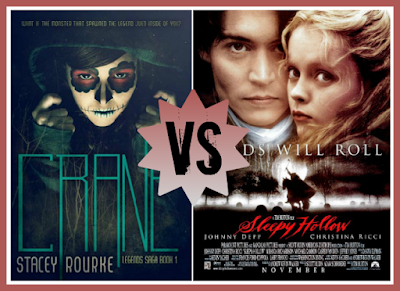 In time, Ichabod becomes smitten with a local lass, Katrina Van Tassel (Christina Ricci), who is the sweetheart of the burly Brom Bones (Casper Van Dien), and he becomes determined to capture the murderer to prove his bravery and win her heart. Christopher Walken, Jeffrey Jones, and Christopher Lee highlight the supporting cast; Lee's appearance is particularly apt, since Burton has cited the Hammer films of the 1960s as a major influence in making this film. Andrew Kevin Walker and Tom Stoppard contributed to the screenplay. This movie immediately has a few things going for it: Tim Burton, Johnny Depp, Christopher Walken. It has been probably ten years since the last time I watched Sleepy Hollow and I didn't remember much about it, so I was really excited to give it a go! Johnny Depp is spectacular in this film!! (Of course, he's spectacular in everything.) His quirky mannerisms and perfect face (I'm biased) work to make the character of Ichabod Crane truly come alive! I feel like Johnny Depp takes pride in becoming his characters for as long as he is in the role and that really comes through here. A very young Christina Ricci is also a great addition to this film as Katrina! She's definitely a unique character! Christopher Walken is a great Headless Horseman who is equally terrifying with and without his head! Fantastic casting and performances all around! I love this adaptation of the story! I love the dynamic of the relationship between Ichabod and Katrina. 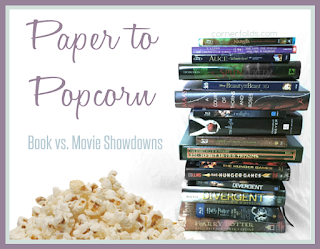 It's so different from the cut-and-dried love story you'd expect! And I loved how Ichabod was incredibly brave throughout the movie, while still being terrified by spiders and fainting at basically everything. There's enough Burton-esque comic relief to make this movie light enough to be appropriate for a broader audience than strictly those who are fans of horror. Still, this is absolutely a horror movie and the mystery keeps you guessing right until the very end! Sleepy Hollow has the creepy setting that immediately comes to mind when I think of the original story, compliments of Tim Burton's unique style that we've come to know and love. The fog that settles over the town, combined with shades of blue and black and the surreal nature that Tim Burton movies are known for make this movie convey a sense of dread that lingers from beginning to end. It is, in a word, perfection. The music builds tension wonderfully, although it was a bit too loud at times for my taste. The limited CGI that was used in making this film has held up well for the most part, with a couple exceptions. Not too bad for a movie that's 16 years old! I was a little wary about reviewing such an old movie, to be honest, but this one really holds up! 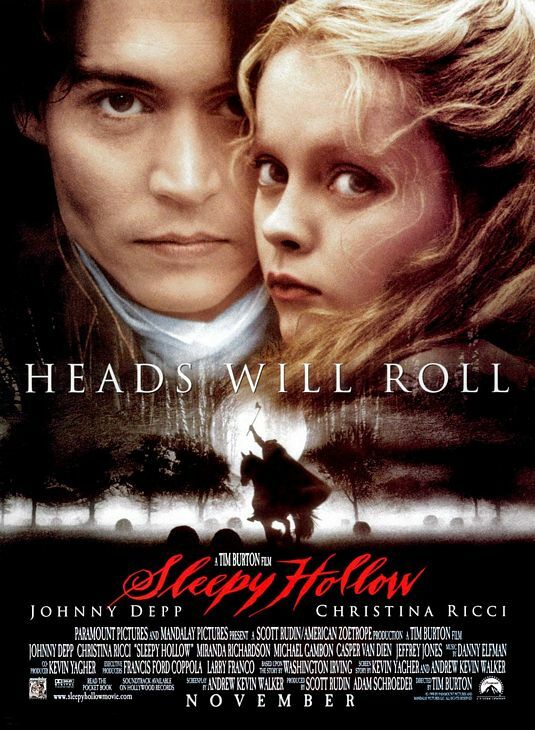 If you're a horror fan and haven't seen Sleepy Hollow yet because you're worried that it's too old school, I highly recommend you give it a shot! The most noteable difference is that Sleepy Hollow is strictly the story of Ichabod Crane, while Crane also tells the story of Ireland Crane in the present. Ichabod Crane is a schoolteacher in Crane, but he is a constable in Sleepy Hollow, sent to the town to investigate murders. Washington Irving (the original author of The Legend of Sleepy Hollow) and Rip Van Winkle (a character in a different Irving story) are important characters in Crane, but (obviously) never show up in Sleepy Hollow. Katrina dabbled in witchcraft in the movie, but this is not an element in the book. The person in control of the horseman and the way they came by that control differs from book to movie. The outcome for Ichabod was significantly different between the two. Whoomp there it is! 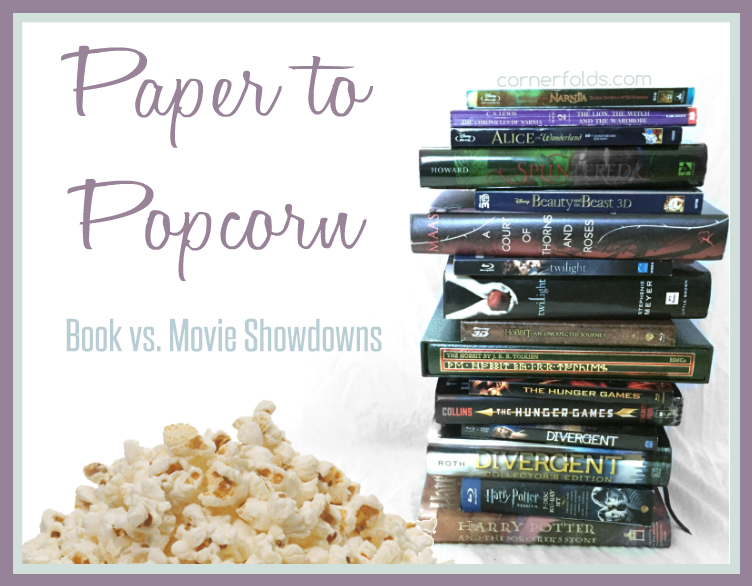 The first movie to beat a book in Paper to Popcorn. While I did enjoy what the book did with Ichabod's distant relative, I really loved the strict Ichabod Crane retelling even more! Add to that that this movie was directed by Tim Burton and featured Johnny Depp as Ichabod and it's not surprising that the film won out!